I've been getting Gourmet and Bon Appetit for a couple of months now and try to always rip out at least one recipe from each issue that I would like to try. 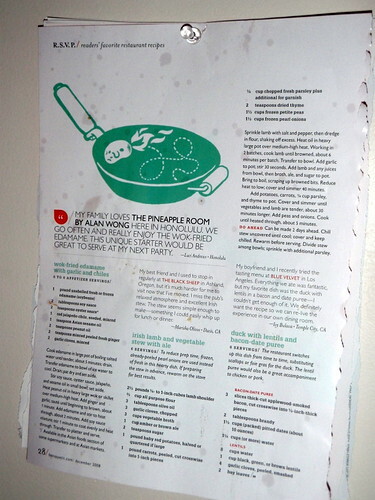 And since I'm usually reading these magazines in bed, I'll just add them to my growing collection of recipes that I have on my wall, stuck there with a single thumbtack. Not exactly the most aesthetically pleasing of decorations, but it means I see them at least twice a day; reminders that I should be trying them out. I've had this one stuck up there for weeks and finally tried it this past week. And it's probably a good thing I've waited so long because it is absolutely addicting. I'm sure if I had made them sooner I'd be waist deep in edamame shells by now because I. Just. Can't. Stop. Eating. Them. I love eating edamame just boiled in salt water, but these...these are a higher species of edamame. The soy sauce and oyster sauce add a depth of umami, the hot sesame oil brings just enough kick to transcend the saltiness, and the garlic makes this dish deeply satisfying yet keeps you wanting more (yes, I realize that doesn't really make sense, but it's true). I get my edamame frozen from Trader Joe's. And if you don't have hot sesame oil, you can use regular sesame oil and add one minced, seeded jalepeno pepper. The original recipe also called for 2 teaspoons of minced fresh ginger, but I don't like ginger that much so I omitted it from mine. Bring 4 cups of water to a boil and add edamame. Once the water is boiling again, cook for 5 minutes or until tender. 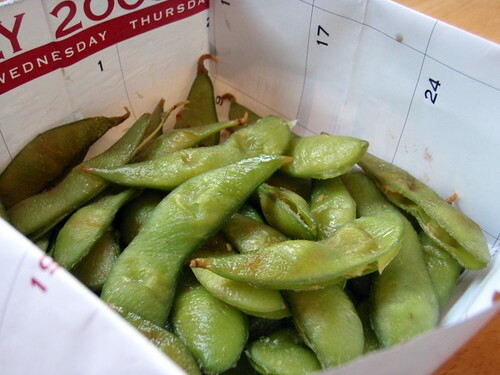 Drain and transfer edamame to a bowl of ice water to cool. Drain and pat dry or use a salad spinner to dry. Set aside. Mix together soy sauce, oyster sauce, and hot sesame oil in a small bowl. Set aside. Heat peanut oil in a heavy large work or skillet over medium-high heat. Add garlic; saute until beginning to brown, about 1 minute. Add edamame and stir to heat through, about 2 minutes. Add soy sauce mixture; stir 1 minute to coat evenly and heat through. Transfer to platter and serve. To eat the edamame I pick it up from the stem end, put the other end in my mouth, and squeeze the beans out, sucking off the sauce and garlic as I pull the shell out. It can be a little messy, so make sure you have something to put the discarded shells in and a napkin to wipe your fingers with afterwards. Oh, I remember this recipe. Looks delicious! thanks for posting this--it's not on epicurious OR bon appetit and i was desperate to find it! lifesaver. 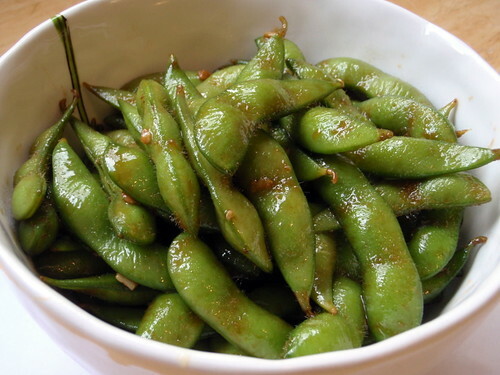 I had togarashi edamame at Lazy Dog Cafe the other night and have been searching for a similar recipe ever since. This looks close, will try it. They are addicting! Wanted to be able to go into edamame coma at home! Thanks! I was looking for something like the appetizer at Lazy Dog and found this...SO good and perfect for the dinner party we had. I added orange peel for taste and some sesame seeds (all to the sauce mixture) turned out incredible! Thanks so much!